Shonda Rhimes has dominated ABC Thursday nights for over a decade. Before the Scandal and How To Get Away With Murder creator departs network television for Netflix, she offers us a spinoff of her own Grey’s Anatomy. 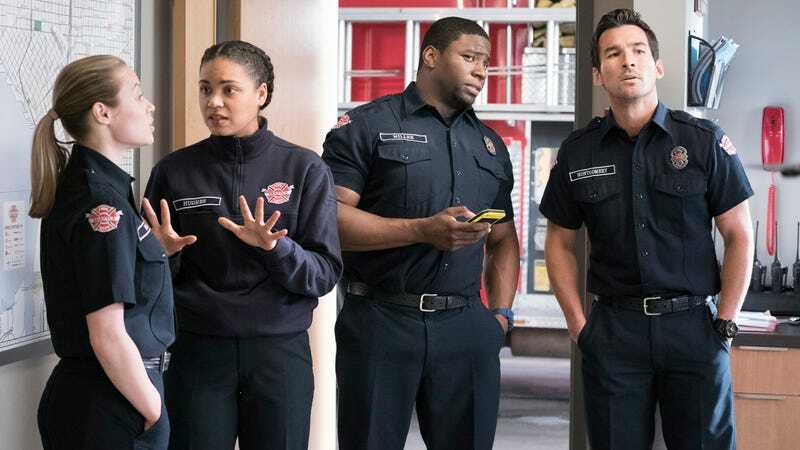 Station 19 focuses on a scrappy team of firefighters, as newbie Ben Warren (Jason George), husband of Grey’s Bailey, tries to transition from surgery to firefighting. But where Grey’s offers various medical maladies as allegories amid the bright, shiny setting of the hospital, so far, Station 19’s adventures seem to be the exact opposite. The nature of the firefighting beat involves donning significant gear (which muffles the dialogue) and walking through dark houses, feeling walls for heat. Sure, there is some suspense as characters are on the lookout for flash points or backdrafts or whatever, but even in the first episode, a few of the feats already seem similar, and we don’t know the crew members enough to be able to differentiate them very well in their laborious outfits. The non-fire adventures might be more successful, like when a young woman gets stuck between two walls and needs Andy to scrape her out. Of course, this takes place the morning after Andy sleeps with her high school boyfriend while still with her almost-fiancé, so the anvilish Shondaland metaphors are still in place. Andy tells the stuck girl, “You just have to decide you can do this. You can figure this out,” and we all know who she’s really talking to (the episode is called “Stuck,” after all). The Shondaland cast chemistry, unfortunately, is less than intact. Andy is gutsy, fights for a promotion—her old boyfriend calls her a “badass.” But in the only episode released for critics, we get very little from the numerous other firehouse members. Jay Hayden, late of The Catch, plays the cautious, paternal type that apparently eats healthily. So why isn’t he the lieutenant instead of Jack (Grey Damon), Andy’s boyfriend, who is a bit of a hothead and hates paperwork? Danielle Savre is Andy’s nondescript BFF, and Okieriete Onaodowan and Barrett Doss barely make a ripple as team members. The only character we’re even familiar with is George’s Ben, a usually likable guy who’s just straight-up annoying here. He’s continually reminding his new co-workers how he “held actual beating hearts” in his hand in the OR. Even a high-schooler working at a frozen yogurt stand for the summer can tell you that bragging is the worst way to get along at a new job. Fortunately, Bailey talks some sense into him this episode as part of the crossover, but we know we can’t count on her every time. The mechanics of actual firefighting, as with surgery, could actually be interesting: The captain talks a lot about the parameter and “containing the flame,” but there’s little talk of how to actually do so. So far the team’s MO seems to be to run into the fire and feel some walls. There’s a laptop charger incident in the pilot that may give some This Is Us Crock-Pot phobics something to ponder, and a leap from a tall building by some firefighters is certainly impressive. So far the focus appears to be Andy’s attempt to turn herself into a team leader, but odd inspirational speeches like, “I’m done chasing the rabbit. I am the rabbit,” seem unlikely to motivate anyone to follow her to a Starbucks, let alone into a raging fire. It’s true that Station 19 needs to find a way to make its rescues more interesting, but making its cast more intriguing might be even more vital for the show’s survival.